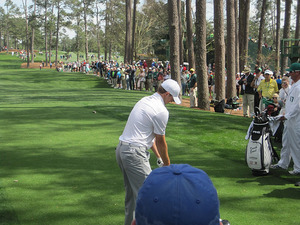 Rookie golfers certainly made names for themselves at the Masters Tournament this year. Swede Jonas Blixt, for example, led the field for the majority of the first round. But it was Jordan Spieth who really established himself as the future of the PGA Tour. For most of the third and fourth rounds, it seemed like Spieth would beat eventual champion Bubba Watson and claim the green jacket. However, his inexperience showed as his game broke down near the end of the tournament, and he came in a close second place to Watson. Even in defeat, though, Spieth has set himself up for a successful professional golf career. Spieth was born in Dallas, Texas, in 1993. When he competed in the Masters, he was all of 20 years old. Being young has never stopped him, though. He won the U.S. Junior Amateur in 2009 and 2011. The only other player to win this tournament twice was Tiger Woods, coincidentally. In college, Spieth helped the University of Texas Longhorns win the national championship, and he personally won three events. Spieth graduated early from Texas, and turned professional in 2012. His first PGA Major tournament was the 2012 U.S. Open, when he was subbed in for Brandt Snedeker after Snedeker was scratched from play. Spieth rose to the position of number-one amateur in the world after he tied for 21st in the tournament. Spieth’s Masters outcome is remarkable for a rookie, and is a sign of good things to come for the youth of the golf world. He was even called the “next Tiger Woods” by one Masters commentator. Watch for Jordan Spieth to make big moves in this year’s Major Championship tournaments.